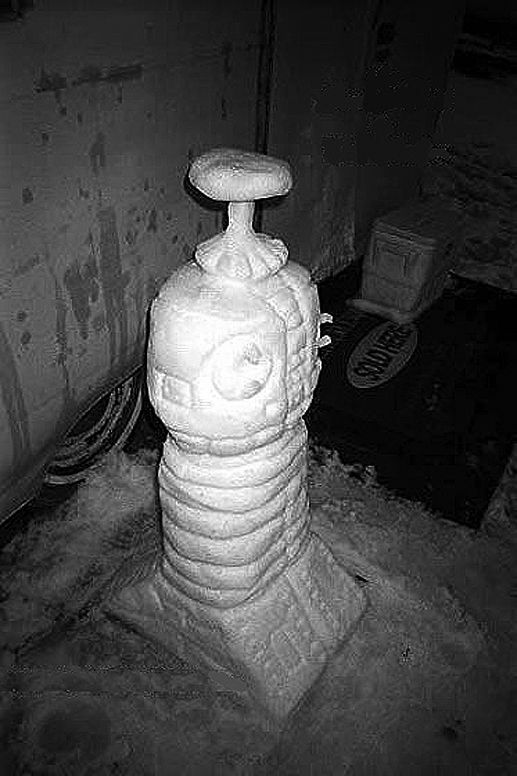 I made the Snow-Bot about 5 years ago. It's not 100% accurate, but he's still worth a look! I mostly worked off an Altoids LIS Robot postcard that I put in my trailer's window as I worked. The snow was great to work with, it was like clay. After I made him, it started to get real cold, so I squirted him down with water and he got a nice frozen glaze to him. This made him last longer, and he was also in a location that didn't get any direct sunlight. I really hated it when he started to melt away! He was my buddy! I lived at a marina on the Ohio River, and he stood facing the water, guarding the boats! He lasted about 2 weeks. (*) Many thanks to Mike Warden for sharing these way cool photos on our B9 friend!